Catholic young women launch self-led initiatives across U.S.
What Nunez learned about the “feminine genius,” a term used by St. John Paul II to describe the gifts of women, helps her, a year later, in her volunteer work with immigrants at the Humanitarian Respite Center in McAllen, Texas. 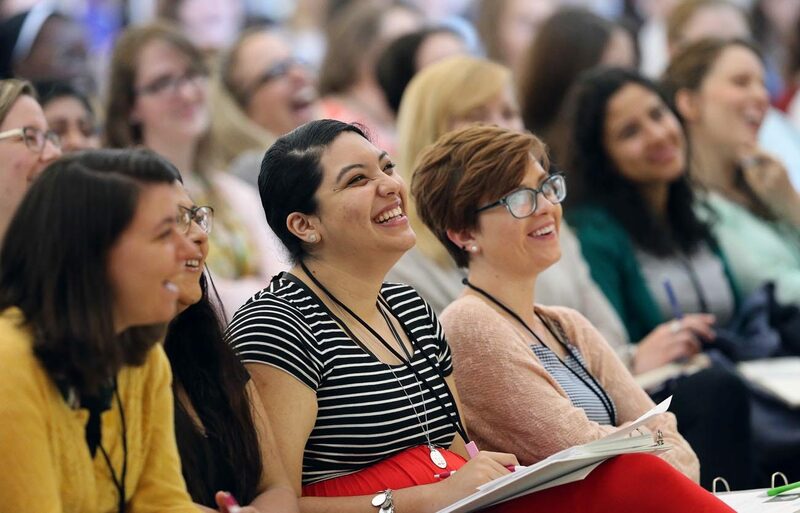 “We wanted each (of the attendees) to receive these truths: You are a gift; you have received specific gifts of nature and grace; the church and the world await your unique expression of the feminine genius,” said Sister Bethany Madonna, a Sister of Life and co-chair of the event. Part of the application process required women to submit “action plans,” new initiatives inspired by their own gifts, interests and leadership skills, which would be implemented in the months following the conference. After graduating in December 2016 from Our Lady of the Lake University in San Antonio, she traveled to the Humanitarian Respite Center to volunteer alongside Sister Pimentel. The center assists immigrants from Central America, who are seeking asylum and traveling to meet family members in the United States. “ICE (Immigration and Customs Enforcement) releases them from the detention center where they are process for about three days. We pick them up from the bus station … give them clothes, they shower” and wait for their buses to meet family members in other parts of the country. Nunez sees her volunteer work as a ministry of listening. “While they’re waiting there, I sit down with them and talk to them,” Nunez said. She hopes to be “a voice for the voiceless” to “share a little bit of their stories with other people here in the U.S.” Ultimately this will bring her closer to the “bigger picture,” her nonprofit. In forming her action plan, Casey Bustamante, 30, saw a need for a “gathering of young adults, active military and spouses.” Bustamante, associate director of young adult ministry with the U.S. Archdiocese for the Military Services, is organizing the first conference for young adults who are military ministry leaders June 16-18 in Northbrook, Illinois. After the Given Forum, Bustamante considered the ways the conference itself could be a model for developing the military conference. She wanted to incorporate some of the training and tools she had received, such as a session on how to best engage with the press and media, led by Catholic Voices USA, whose mission is to articulate the church’s teaching in the public square. “Some of the feedback that I’ve received from young adults is that it’s a challenge to talk about the hot-button issues with their peers and among other military members because our society values are changing, and the military culture is not separate from that,” she said. Bustamante invited Catholic Voices USA to lead a session to encourage the servicemen to freely discuss Catholic issues. Staresinic, who graduated in May 2016 from Franciscan University of Steubenville in Ohio, said the idea for the project began after she read St. John Paul II’s “Letter to Women” during her senior year. “That was the big game-changing moment in my life,” Staresinic told Catholic News Service. The pope’s letter, along with the diverse stories of the female speakers at the conference provided the model for The Catholic Woman’s letters. Prior to the March 8 website launch website, Staresinic looked to “Humans of New York,” a series of photos and captions that offers a glimpse into the lives of New Yorkers, and watched interviews of the creator, Brandon Stanton, to see “how he is able to get insightful and deep answers from people on the streets.” She also read the book “In the Company of Women,” a collection of interviews with women entrepreneurs and artists, for guidance on creating a letter-writing guide for website contributors. Katrina Even, 25, and Dani Bell, 27, of Kansas City, Missouri, connected on Facebook prior to attending the forum, and after meeting in Washington, decided to team together. In conversations while waiting in the airport back home, Even told CNS that their plan was born. The two felt a “strong pull to share what we had learned with the women in our area” and organize a local Given forum. Part of the site features a “Dear Edith” column, inspired by St. Edith Stein, who Povlock refers to as “the feminist saint” because of Stein’s essays on women. The column is a platform where women can submit questions and other women can respond. “I wanted a place where women could reconcile the teachings of the church with their real life experience,” said the Chicago-based working mom. Such positive results that emerged from the original Given Forum give rise to the possibility that another similar, national event may convene in the future.